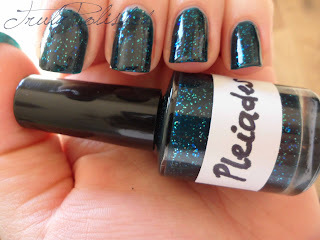 Truly Polished: Pleiades, my beautiful franken! Hope you're enjoying your weekend. Today is my last day here in the Netherlands! I can't believe I'm leaving tomorrow and I've been ill the whole time I've been here. I'm just starting to feel better, it's so typical! Anyway, I have a franken to show you today. I first started creating this in my head just after Christmas. I got the Nails Inc Blair duo from the Gossip Girl Collection (The Wyndham Collection to all you Americans!) and although I loved the blackened teal colour, I absolutely HATED the formula. It was thick, gloopy, stained my nails... It was just a nightmare from start to finish so I vowed I'd make something out of it when the right glitter came along. Then one day I was out shopping and I spotted a glitter polish from BeautyUK that looked perfect! So of course I bought it! I didn't mix drops of each polish or anything to test the combination of these polishes, I just gambled and went straight ahead! To make it I took an empty nail polish bottle, filled a third with clear nail polish, then another third with the Nails Inc Blair polish and finished it off with a third of glitter. Then I added 3 stainless steel balls and shook it up for as long as I could manage! When I was done shaking it, I nervously unscrew the lid and tested it. As soon as I saw the colour, I breathed a sigh of relief because I LOVED IT! I wore it for days and was a bit heartbroken when the time came to take it off! I called this polish Pleiades, because the colours remind me of the open star cluster that I can't wait to finally see one day with my telescope when I have time! It's a blackened teal creme with blue, green and teal square shaped microglitter. There is the odd gold bit but it's very sparse! Here's a macro shot of the polish! 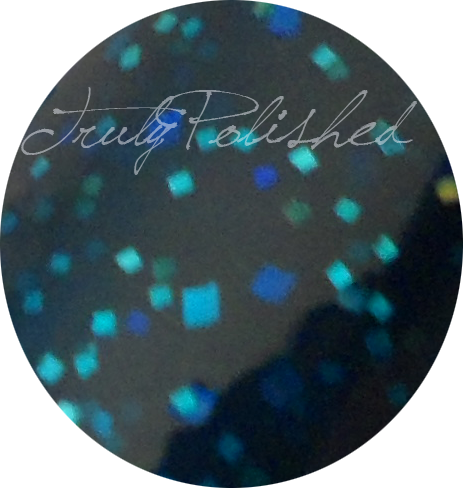 Click "Read More" to see the rest of my photos which all show two layers of Pleiades with one coat of Seche Vite. As I've already mentioned, this is probably my favourite franken of all time! I think I'd be amazed if I made something I liked as much as this, we'll have to wait until I get some Spectraflair! The Blair Collection that this base colour is from is currently out of stock on the Nails Inc site (probably because Blair is everyone's favourite character!) but the set retails for £20. The glitter polish I used was simply called "Blue Glitter." It's by BeautyUK and I got in at Internacionale for £2.49. The clear polish I used was just a cheap Collection 2000 one I got for 99p at Fragrance Direct online.